We live in an age of speed, expedience, brief thoughts and long illusions; we relish fast images, swift exchanges of truncated words, and hurried displacement; we rejoice in monumental structures, ideas, endeavours. News, whether of catastrophe or joy, races through our minds or past our eyes like flashes of lightning; we claim to experience life passionately, with almost brutal realism, and we indulge in nostalgia and novelty in equal measure, with commensurate resolve. We claim to live the here and now to the full. But what of the before and after? Do we remember all these evanescent instances of the everyday or the otherworldly? Do we spare the time to feel the moral weight of the events that so fervently engross us with their crashing impact, remember the connections or disconnections, and find a balance as we proceed along? We certainly create sequences, time-lines or links. We collapse time and almost want memories to happen before the experience itself. But do we remember? Can we remember? We remember unfailingly how to forget; we rarely remember how – or why – to remember. After WWI we became aware of the annihilating traumas of violent memory; after WWII many voiced an even more damning despair: memory itself was annihilated; at best it would be for ever onwards fragmented, ineluctably it would always be a burden. Post-WWII modernity claimed to provide a solution: newness, postmodernity, the proclamation that memory was an unnecessary construct, a delusional illusion. This long observation is tragically true. 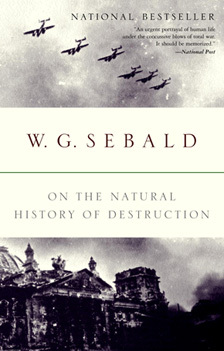 The terrible thing about building the future in this way after such horrors in our past is that it makes it “look as if the image of total destruction was not the horrifying end of a collective aberration, but something more like the first stage of a brave new world.” Shockingly for some, prophetically for many, Sebald argues here and in most of his other works that horror does not arise only from the act and aftermath of destruction and violence, but especially and more sinisterly from a reconstruction of the past and of man’s future material environment without memory – without ruins and pain: for if we grow without memory, “without an idea of destruction”, as he says in After Nature, we will never understand the causes of destruction. If we live without the memory of violence, he might as well argue, we will always necessarily exist in very real or imminent violence. Memory, however, is notoriously and inevitably fragile and vulnerable. How do we remember without succumbing “to the temptation to make the real horrors of the time disappear through the artifice of abstraction and metaphysical fraudulence”? How can we hold on to memory without shattering it or violating it? How do we expose the facts of a memory of violence without breathing new life into the monsters lurking behind it, or killing brutally through the naturalisation of horror or through oblivion those who have already died as a result of the thing remembered? Should we remember things, events or people? How do we simply remember and what do we do with memory? Germany, to our detriment, is not unique in having had to deal with the horrors and demons of almost impossible remembering. And the question of how to remember, how to preserve memory and how to include it both as a story and as a physical reality, still remains open and pressing. 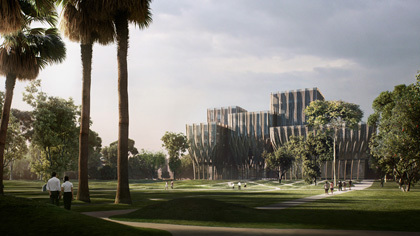 Zaha Hadid Architects have offered an answer of extraordinary ethics and aesthetics in their recently presented design for the Sleuk Rith Institute, a new research facility and genocide memorial in Cambodia’s capital Phnom Penh. It is a building that truly responds to the country’s recent history of violence through the prism of Sebald’s criteria; it combines the words forced out of the mouths of those who died, the words left unsaid by those who had no time to speak, with the act itself of embracing and recording memory, with the promise of both a release from and an encounter with one’s past. 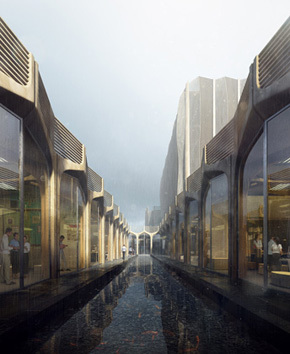 In a unique and transfiguring way, the design of the building embodies the story behind it. The name Sleuk Rith means ‘the power of leaves’, referencing the dried leaves used by Cambodian religious leaders and scholars “to document history, disseminate knowledge, and preserve culture during periods of harsh rule and grave peril.” The proposed building is precisely such a composition of ‘dried leaves’, a structural complex of breathtaking, arresting beauty to be built using natural materials –predominantly timber wood – and encompassing reflecting pools of water, atria of air and light, a memorial park, functional vegetable gardens and fruit orchards, meadows, and a forest that will house contemporary sculpture. The structure grows organically from the soil, branching out into the spaces of the several purposes it is meant to serve: institute, graduate school focusing on genocide, conflict and human rights studies, archive library and research centre, auditorium and media centre. It is like an epic tree-house inviting humanity to dream, rising from dark or light mists of memory and providing a haven for new life and tranquillity. It offers a focus for sadness that allows for balanced reflection, and it especially allows for the return of the souls of those who perished to a place of stillness and compassion, where they may once again whisper their stories to the living through the pattern of rustling leaves. The abysmal violence these souls suffered is not forgotten – it is, on the contrary, the underlying dynamic principle of the project. The name and the design together constitute an immensely powerful symbol of the atrocities of the Khmer Rouge rule, as well as of the fragility of the victims – and of all memory. Political dissidents (or anyone targeted for persecution) were forced to write full, excruciatingly detailed confessions of their alleged crimes against the regime. The moment the writing stopped, life stopped. So the writing continued, horrific and fantastical, on page after page, in a desperate, irrational attempt to use the inevitably ending endless stories on these countless leaves of paper as impossible life-lines. It is memory and reflection that continue on the endless clusters of leaves on the building’s facade. Yet the upward thrust of the elements, the interconnectedness of the five volumes of architectural composition, the open-endedness of the parkland and the fecundity of its many constituent entities give this memory a character that is as much part of the past as it is of the present and of the future. 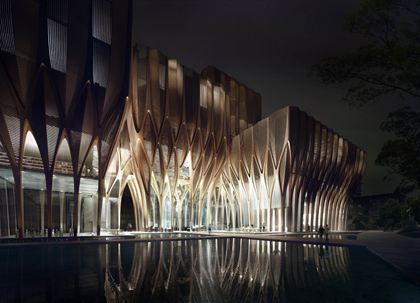 Zaha Hadid calls her design a ‘covenant’ to the people of Cambodia, and the word is beautiful, apt, brave and especially true. It is a promise and an agreement for a new ethos, based on recent old knowledge and experience, and on an older, civilising wisdom. We are our memories, the stories they engender, the story they allow us to tell and live. Stories, after all, are perhaps what humanity is all about. We might even see storytelling, the moment a group of creatures sat in a circle to weave together the threads of a tale, as the first true moment of our existence. We first told stories to one another or painted them on cave walls; and then we wrote them down so they would be remembered, histories as well as tales, facts as much as fictions. Stories have created and sustained communities or eliminated them. But we are equally the ‘painted walls’ of our storytelling prehistory, the buildings that we cause to exist, the built environment that we create. Stories and architecture could be said to be one and the same, our verbal narratives and our material contexts show who we are – who we wish to and can be. It is surely no accident of the imagination that Dante’s Inferno possesses the most thoroughly contrived structural stratification and tight urban planning – and his Paradiso only true ‘divine architecture’, the harmony of memory and vision. We often forget how to remember; the Sleuk Rith Institute will perhaps remind us how to cherish memory once more, how to contain pain, and dream of a reality of greater kindness and less evil; how to reunite aesthetics and ethics in order to house our thoughts, our lives, our pasts and our futures inside our minds as well as within physical spaces, how to keep them and protect them, learn from them. In answer to Sebald’s Natural History of Destruction, Hadid offers a poetic and sincere natural architecture of regeneration, combining two qualities rarely found together: gentle humility and grand nobility.